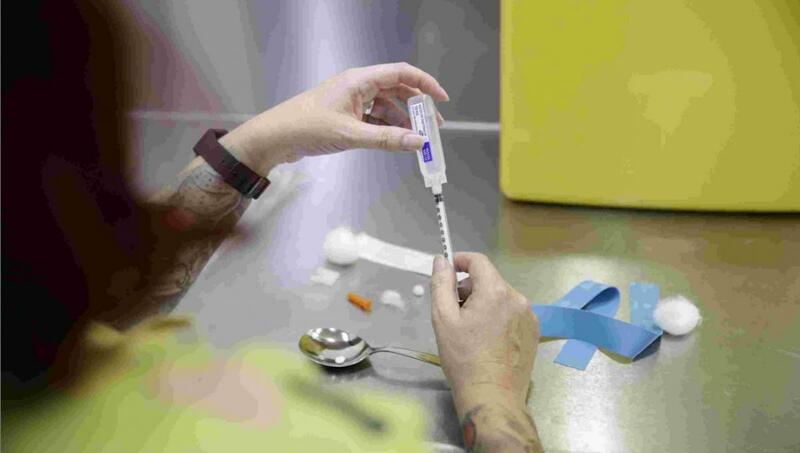 In normal, developed countries where care and rehabilitation for drug users is real, and not merely declarative, as well as in countries which work substantially, and not just making-do, on sustainable programmes for prevention and protection of drug use effects developed for citizens who have decided to use drugs – in those countries it is not at all unusual to implement programmes for opening safe drug use facilities, starting with the so-called soft drugs (cannabis, hashish) all the way to drugs most likely to impact the lives and health of people and having the biggest potential to create addictions – here, above all, I mean opiates. The most public and popular example for safe drug useare of course the well known coffee shops in Amsterdam, the Netherlands. Certainly, the word “safe” in this context is almost obsolete since the fact that cannabis is safe and does not bring about harmful consequences on people’s lives and health is well known, its use justified from a purely legal aspect. Of course, the idea behind is, I presume, to target the safe use of harder drugs, specifically the use of heroin injection. In the 21st century, globally there are already positive examples of how states should regulate this issue. These spaces, better known as Safe Injection Sites (SIS), are spaces permitted by law, where under medical supervision, in hygienic conditions, without the stigma of the general population, individuals consume drugs intravenously – spaces which, where permitted, are part of harm reduction programmes and provide sterile needles, treatment, advice and basic medical care. However, it has to be stressed that these spaces DO NOT sell or provide drugs, nor do they suggest to someone the consummation of drugs but rather provide a solution to an already existing problem. In addition, the general public should not be afraid of such spaces since it is exactly them that, along with the drug users, will mostly benefit,from numerous aspects. Primarily, the risk of transmitting diseases via intravenous drug injection is significantly reduced. In addition, such spaces, managed under experts’ supervision, will significantly reduce risks of overdose among users and finally it makes possible the appropriate treatment of drug users in the sense of health and social treatment. As the European Centre for Drugs and Drugs Addiction informed us in February 2017, there are 31 such spaces in 25 cities across the Netherlands, 24 spaces in 15 cities across Germany, 5 spaces in 4 cities across Denmark, 13 spaces in 7 cities across Spain, 2 spaces in 2 cities across Norway, 2 spaces in 2 cities across France, 1 space in Luxemburg, and 12 spaces in 8 cities in Switzerland. Additionally, inSlovenia there is an undergoing project for safe drug use spaces, while plans for opening such centres are underway in Glasgow, Scotland and Dublin, Ireland. On different continents such spaces exist in Vancouver, Canada and Sydney, Australia. As a citizen and a lawyer who strongly believes in the citizen’s sovereignty, I am a bit allergic to the mantra “This is how they do it in the West.” Not all examples are positive, and history teaches us that not all good intentions for controlled and supervised drug use have had positive results. The most notorious negative example is of course the Platzspitz Park example in Zürich, Switzerland. Faced with heroin epidemics, Zürich’s local authorities attempted to target the problem in a way that made it possible to freely use drugs intravenously in a limited area, without fear of legal repercussions. The project had a boomerang effect on the local authorities since it attracted drug dealers from across Europe who recognized the benefit, while the medical supervision and social treatment lagged behind. As a result of this, as well as the impossibility to achieve what was intended – to reduce intravenous heroin use and the spread of diseases – this unfortunate project was quickly dismantled. It is for these reasons that the Republic of Macedonia, as long as its efforts are not purely declarative, has to carry out a serious analysis and re-evaluation of the existing legal solutions and programmes the state provides to its citizens who use drugs. Another good motive, however, would be the protection of the general population from spreading diseases that non-selective and unhygienic intravenous drug use certainly carries as a risk. In order to apply some of the existing modelspracticed or to establish a hybrid and an entirely different model of addressing this issue in the Republic of Macedonia, there are legal obstacles to be considered. Making possible drug use facilities, safe or not, is prohibited and is penalized with Article 216 from the Criminal Code of the Republic of Macedonia, according to which a person who shall provide spaces for the enjoyment of narcotic drugs and psychotropic substances shall be punished with imprisonment from 1 to 5 years. A qualified (more severe) form of this act is considered extant if the same is done with respect to a minor person or with respect to a larger group of people or if the deed has caused serious consequences, in which case the doer will be punished with 1 to 10 years of imprisonment. If, however, the act is perpetrated by a legal person, the same will be punished with a fine, and the narcotic drugs, as well as all moveable properties or any real estate used for their transport or distribution, or if they are especially intended for or meant for use, will be confiscated. Such legal circumstances in our criminal legal system is the result of international legal obligations our state agreed to with the 1961 Single Convention on Narcotic Drugs, as well as the 1988 Convention against the Illicit Traffic in Narcotic Drugs and Psychotropic Substances, decreed by the United Nations, which go as far as providing legal framework for the signatory countries to even confiscate such spaces. Certainly, the Conventions do leave space for exceptions, but for strictly controlled spaces which have to mandatorily operate with license and work permissions. Unfortunately, the Republic of Macedonia does not allocate even approximately enough funding and has no political will to introduce such programmes towards helping drug addicts with harm reduction, as well as protect the very users, but also society, fromspread of unwanted diseases. Since the introduction of such type of programmes entails two crucial moments – a financial and a political one – we can easily establish that the obstacle is mostly the lack of political will, seeing that our politicians are extremely irresponsible on this matter, and also due to politically lucrative reasons (losing votes) they are indecisive about such admittedly radical steps. The chief problem is politics, since the means can always be found – either through the state budget, or through the NGOs, donors or United Nations programmes. The introduction of safe injection facilities firstly prescribes amendment to Article 216 of the Criminal Code with the introduction of exception in the sense that making possible such spaces shall be punishable, EXCEPT in the case of licensed spaces. Further, Article 122 of the Criminal Code would also have to be amended, which specifies the terms used in the Law in order to explain what a licensed institution or space represents. We are talking about an intervention in the legislation, necessary in order to exclude criminal responsibility. Of course, a more serious intervention is required regarding the Law on Health Protection of the Republic of Macedonia, which makes no mention of this treatment and harm reduction programmes. But in this part, the problem is not merely normative. I might consider understanding the negative opinions of uneducated citizens regarding such type of treatment, however, I can in no way offer my understanding to medical personnel who are against introducing safe injection facilities. Unfortunately, a large portion of our doctors hold inadmissible prejudices towards addicts and I recommend that the Ministry work more intensely in this field in the future. As a citizen who strongly believes in the self-harm penalizing approach, but also as a responsible person who believes the state apparatus to be the one who has to guarantee the health wellbeing and prevent the spread of infectious diseases, I am absolutely on the position that in the near future, the Republic of Macedonia has to, at least for starters and as a pilot project, implement one such programme providing safe drug use spaces, which will provide health benefit for users, but also for the citizens. The author has been practicing law since 2012. He finished his master studies with a thesis on “Legalization towards Eradication of Drug Trade” from the Iustinianus Primus Faculty of Law at the St. Cyril and Methodius University in Skopje. He is a fervent supporter of legalization/decriminalization of all drugs for personal use. His articles are published in the legal magazines “Pravnik” and “Pravomatika” and he is the co-founder of the Cannabis and Green Policies Association BILKA Skopje.